Graves’ disease is a condition in which the body produces too much thyroid hormone, essentially the opposite of Hashimoto’s hypothyroid. However, both Hashimoto’s and Graves’ have an underlying immune component thus making functional medicine a management consideration. Today we speak with Zenaida who has overcome Graves’ with a combination of functional and conventional medicine care, and is now off all medication. Her case illustrates that both can be used together quite successfully. Conversation with my patient Zenaida who has overcome Graves’ disease. For more information, read our article on Natural Management of Grave’s Disease. Get help with Graves’ Disease. Dr. Michael Ruscio: Hi, this is Dr. Ruscio. I’m here with Zenaida who has done great with Graves’. And twisted her arm to get her to sit down and chat today. We’ve been working together now a little over two years I believe. DrMR: Yeah. And you first came in with Graves’. It was a mild case of Graves’ and you had responded really well to methimazole which is one of the frontline medications that’s used. But you wanted to see what else you could do not to need the medication and to kind of manage the Graves’. And she had done a great job with research on her own, looking into the paleo diet, autoimmune paleo diet. So the autoimmune paleo diet was the diet that we used. We also found some dysbiosis in the gut, mainly yeast. And we also used some of the natural compounds that can help with thyroid autoimmunity which underlies and causes the Graves’ hyperthyroidism and also some natural agents that can help to calm down the high levels of thyroid hormones. And you responded beautifully. Zenaida: Yeah. It was a process on its own. Before I met you, I did a lot of research obviously and just wanting to find a more holistic functional way to treat things rather than the conventional side of things. DrMR: Sure. Which I think makes sense because methimazole I think is a fairly good drug, but a basic question, what else could we do besides methimazole to mitigate the need for the methimazole? And you’ve been off the methimazole now for, what, about six months? DrMR: So now she’s been off the methimazole for about six months and also weaned off a good amount of the items in our natural program and expanded her diet. And that was one of the things we talked about today was not being afraid of food, not getting freaked out about the stuff you read on the internet and finding your own tolerance to these different foods based upon your reintroduction. Gluten seems to be the one food, thankfully, out of all off them. The only food that you’re really reactive to is gluten, so you’re avoiding that. Find anything else there that you think is noteworthy? Zenaida: And just planning out the next steps on whether you’re reacting to something or how you’re feeling because that’s huge. Just being more mindful and knowing the things we are reacting to, figuring out how to make you feel better. And that was the biggest process of this whole journey. Definitely there’s some things that I’m working on, like sleep and hair obviously. But definitely this whole journey taught me how to eat better. It’s given me better habits on just living life and changing my lifestyle. DrMR: Yeah. And you make a lot of great points. I think it is, just like you said, important to listen to your body because if you don’t listen to your body, then you listen to everyone else. And there’s all these dietary restrictions recommended. 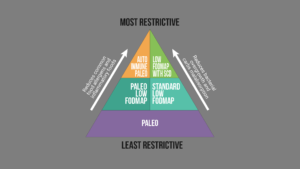 And so, you can just get pulled further and further into dietary restrictions rather than like you’re doing now which is broadening your diet and figuring out the broadest diet possible. So yeah, I think listening to your body is really key. And then also, just keeping in mind that with time your body will heal and you’ll get a lot—if things are done right, you’ll improve a lot. And in your case, there’s I think one simple thing and we talked about adrenal testing and a lot of things that I think are putting the cart before the horse. But right now, the final tweak, at least in my mind and we’ll know this better probably in about three or four weeks, is your carb intake may be a little bit too low. And that may be what’s driving your only two lingering complaints which are getting better with time, but they’re not fully kind of getting better, which are waking up early and hair thinning. And that can be caused by Graves’, but it can also be caused by being too low carb for too long. So we had to get the Graves’ right first and give your body some time. And now that we’re seeing those symptoms lagging and we discussed today bringing her carbs up to about 175-200 grams a day. And I have a good feeling that that’s going to totally sort out your sleep and your hair, and I think you’re going to do really well. Zenaida: Yeah. It’s definitely the art of fine-tuning. DrMR: Yeah, fortunately you’re at the fine-tuning phase, which is great. Zenaida: Definitely. Definitely it was—things don’t happen overnight. Throughout this whole journey, you see improvements as you go along, but you know that you’re getting somewhere. The positive side of things is that you’ll know yourself better just by all things that you’re observing, and you’ll feel better too. DrMR: And just one thing, this is a point I’m passionate about and I know the audience knows this. We did some testing. But would you say we did a lot of testing? DrMR: No. And we didn’t need to. Use testing to kind of get a lay of the land and figure out what some of the key aspects are and that’s it. You don’t need to… I didn’t need to beat you over the head with this constant repeat testing, and a lot of this stuff is just good clinical horse sense, steering the ship. You’ve done great. She’s got a beautiful family. They were all in here just a few minutes ago. And I’m super happy with how you did. A couple of little things we’ll tweak now, but I think in a few weeks you’ll be pretty much at like 99%. And I’m really happy for you. DrMR: Yeah. And thank you for taking the time to share with us. Thank you for sharing. I respect how you approach your patients. Amazing result! I have been following you since I saw you at Metagenics congress in Hunter Valley, Australia. If this country (U.S.) had a lot more doctors like Ruscio and a lot more self-educated patients Zenaida, I bet we could cut our total healthcare costs by at least 75% and pharmaceutical costs by more than 95%, all while improving our overall health by at least 200%. My barely 17 yo daughter was literally diagnosed with hyperthyroidism on a Tuesday and by the next evening she was admitted to the Pediatric ICU for a thyroid crisis. She was started on Methimizole 10mg/tid and Propranolol 30mg/q6h. Unfortunately, by end of Week 3 she developed severe joint pain, stiffness, and raised reddened areas over the joints of fingers and wrists, as well as light red blotchy areas on backs of hands. Practitioner immediately dc’d Methimizole but the symptoms are persisting. I am an RN, so I did a bit of research and questioned SE could be from the Propranolol. We are now in a “do something definitive now because she is at risk for another crisis” mode. The only thing controlling her HR at this point is the beta blockers which we are having to increase every few days and are now back up to 60mg/d. My question is whether you feel it would be reasonable to try your protocol or do you agree that the thyroid needs to be removed? If we go ahead with surgical removal, I will be making an appointment to get her on your protocol to manage the resulting hypothyroidism. Thank you in advance for your opinion.